Jesus said, “Go…,” and we take him at his word. One of our core purposes is to go in mission to God’s world. It starts here at home. It extends across our nation and around the world — wherever God leads us to care for those in need and share the good news of God’s love and compassion in Christ. A Christian leader once asked, “If your church disappeared tomorrow, would anyone in your community shed a tear?” We are devoted to making a Christ-inspired difference in the lives of those around us. 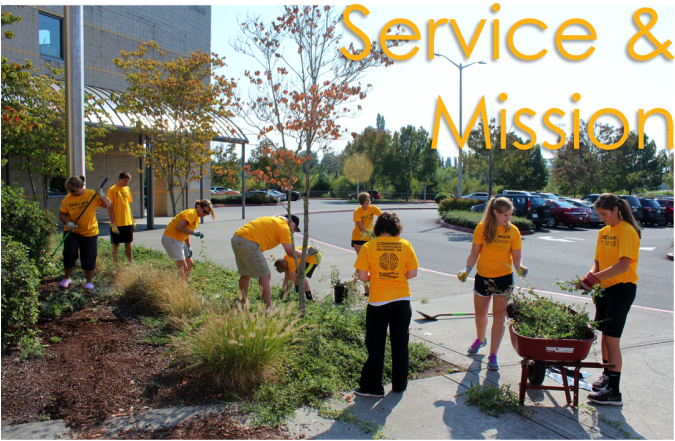 And we are devoted to putting Christ’s love into action for the sake of others in our world. We invite you to consider taking part. 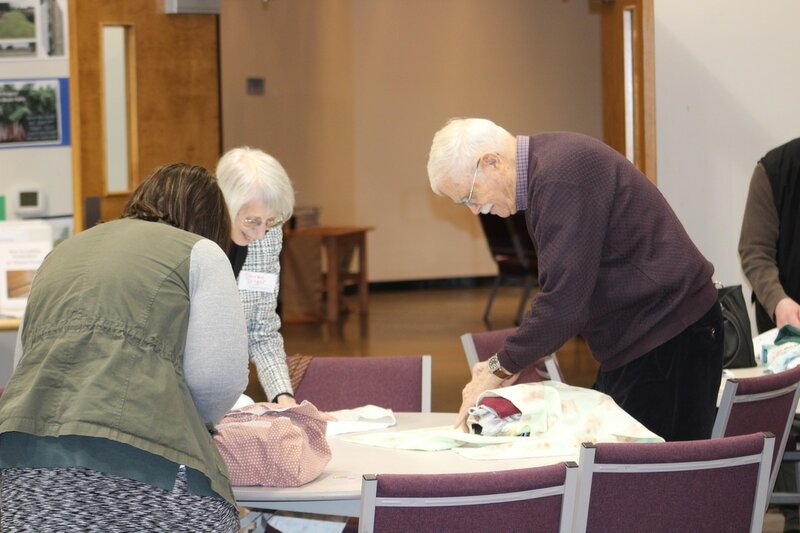 The Service and Mission Team is active every season of the year to equip and lead the people of ChristChurch in works of compassion for those in need. use his or her gifts and skills in community service. Participation is open to anyone. Newcomers are always welcome to participate in all meetings and activities. The projects undertaken are prayerfully chosen to serve the local community and the world in the Spirit of Christ. 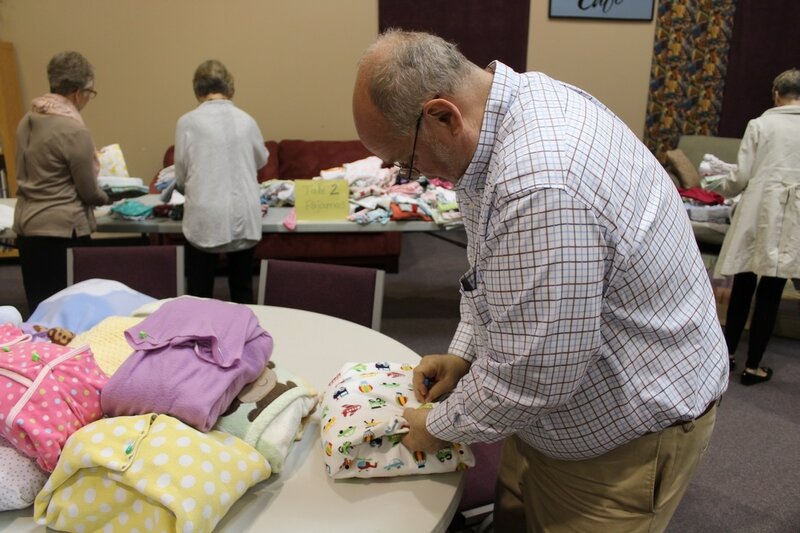 Guiding principles include projects focused on assisting with immediate needs—such as shelter, food, clothing and medical care—and which promote the self-sufficiency and dignity of those we serve. Some of the "God's work. Our hands." Sunday participants helping out at the Hertel Center. Members of Christchurch are part of the crew building this Habitat for Humanity home. the homeless, and community support by providing Mission Fairs and the Give-a-Gift program. to serve. If you have an area of interest or ideas to share, please contact the Service and Mission Team using the form below. 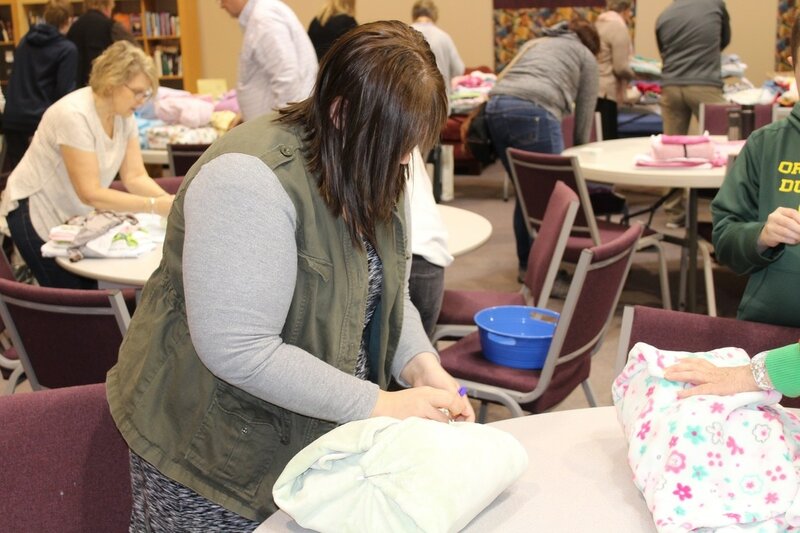 This ChristChurch service opportunity provides a way for our congregation to engage in serving locally. Backpacks and school supplies are needed for families with young children at the Family Promise Hillsboro shelter. Over the next two weeks we will collect school supplies to assemble 10-12 backpacks for children in a shelter setting. Pick up a supply list in the Commons. Supplies are gratefully accepted through August 27th, 2017. You’ll find the collection basket in the Commons. 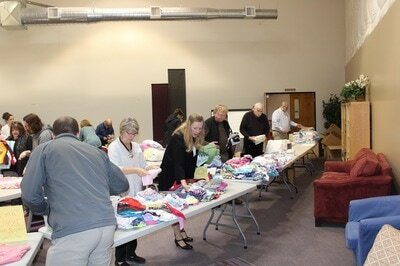 ​Thank you for considering joining in on this important service to our community neighbors! Our Lenten global service project this year will be Baby Care Kits. ​Our kits will go around the world, helping people in need provide for their families. We will be collecting baby care kit supplies (ages 6 -24 months) in the barrel starting this Sunday through Easter. ​We will assemble them after Worship in late April. Shirley Dinger is leading us on the project again this year. She's laid out an example of what goes in each kit in the Commons. I have been volunteering there for over four years, every Tuesday morning from 8:15 to roughly 1:30 or 2:00. We help hundreds of people that come every Tuesday between the hours of 9:00 and 1:00 or 4:00 and 7:00 with the need for food. They are one of the best food pantries in the NW as I'm told. All is free, of course, and they provide vegetables (fresh at times), meat, canned food items, snacks, bread, pastries, rice, noodles, milk, eggs, etc. The inventory of what is provided to the clients varies week to week but most people leave with about 7-8 bags of groceries every single Tuesday. This isn't just a pantry for Washington County. They serve anybody from anywhere in God's name and even if somebody doesn't have an address (homeless), they can still sign up. I love volunteering there so much. To see the happy people and children get food to survive is an amazing feeling for me. The one thing they have been needing over the years is toilet paper for the clients in need. Although Linda Eld (the former Pastor there) and I have talked about this several times, she indicates all her efforts to get toilet paper now and then is futile most times. She has applied and asked for this donation but it never seems to happen. Thank you for donating to this important cause in our community! 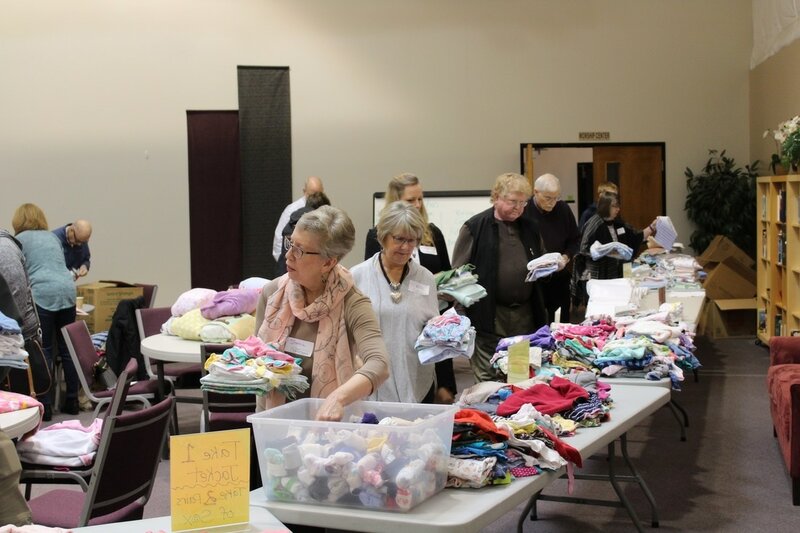 The ChristChurch Service and Mission Ministry provides opportunity for our congregation to engage in serving locally and beyond. Backpacks and school supplies are needed for families with young children at the Hillsboro shelter, Family Promise and the Hillsboro school high priority schools. This year we have a goal of collecting for 25 backpacks with supplies for 2nd and 3rd graders over the next three weeks. You can pick up a supply list by the barrel, on our webpage or in the weekly faith news. You’ll find the collection barrel in the Commons fellowship room. Thank you for considering joining in on this important service our community neighbors! ​Thank you to everyone who brought in food for our food drive in September 2015! We collected 288 lbs of food and $400 for the Hertel Center.